Our first morning in Wales was just like the previous day – cold, wet and generally miserable. 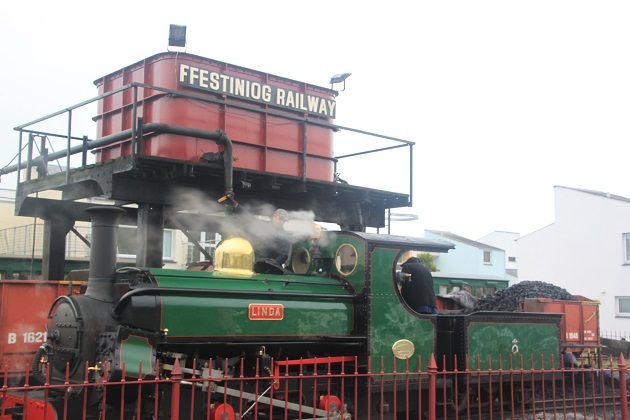 Still, undeterred, we decided to keep with our original plan which was to ride the historic Ffestiniog Railway to Blaenau Ffestiniog – despite the rain we thought the one hour and fifteen minute train journey sounded fun. Plenty of options regarding train times, we chose one at ten o’clock, bought our tickets and waited. Not cheap by any means – it cost £21.50 each for us but Son went free and they have to upkeep the railway and the trains somehow. The ticket allowed us to break our journey at intermediate stations – a great idea. We found an incredibly busy platform and the train already pretty full by the time we got close but did still manage to get seats together in one of the little carriages. Red velvet seats, lots of wood, old fashioned and quirky – I loved it. Some of the world’s first railways were built in Wales, at first hauled by horses to carry coal and slate from pits and quarries in the mountains to the coast. 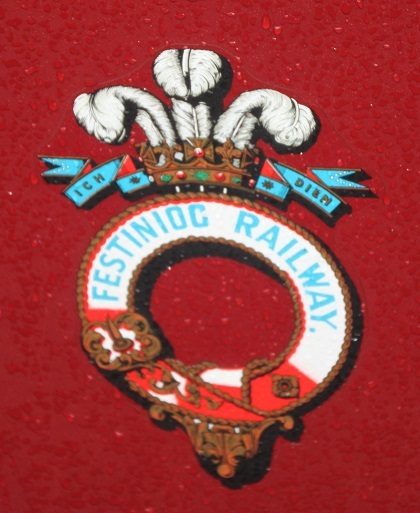 Ffestiniog Railway was established in 1832 and is the oldest independent railway company in the world. 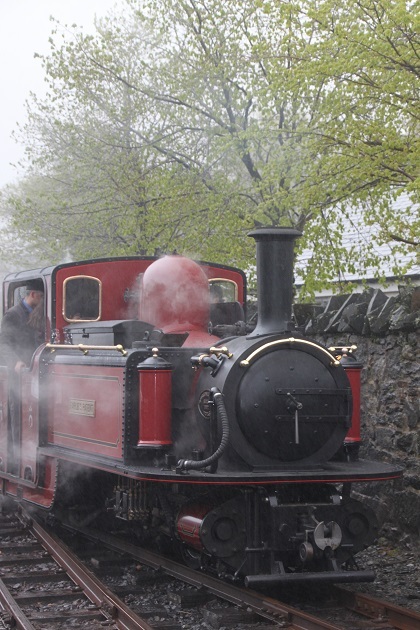 Originally it too was horse-drawn and built to transport slate from the nearby mountain mines down to the port. The line fell into disuse with the decline of the industry but is now used for tourists. You definitely do not need to be a railway buff to enjoy this trip. We puffed out of Porthmadog slowly on those narrow guage tracks and made our way past the harbour. Especially gorgeous as the sea laps right at the base of the railway. We climbed steadily for the 19 mile journey and passed through woodland, lakes and ascended 700 feet into the mountains. The train loops, twists and stops at various halts en route. The weather, bad enough when we left just got worse. Misty and pouring with rain the views were not what they should have been. We did though love the huge waterfall just before we arrived in Blaenau. The scenery was varied – the estuary at Porthmadog, the green valley and the grey slate hills – just shrouded in mist we really struggled to see much. We had planned to get off at a couple of the stations on the way – one in particular had a waterfall walk but the driving rain put us off that idea. A couple of hours in Blaenau then it was back on the train again. Empty this time for the return leg, we chugged back to Porthmadog, soaked through and very chilly. 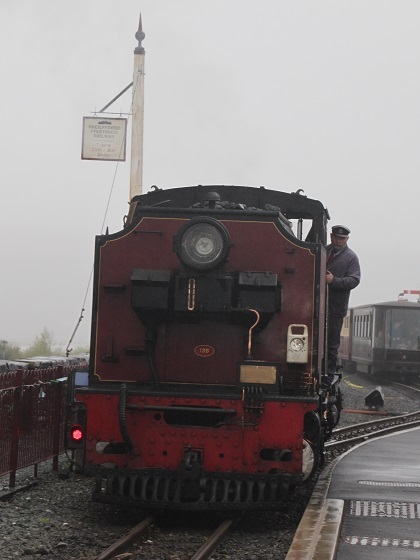 We enjoyed our expedition on this lovely old train, just need to do it again someday when we can actually see the views. Looks lovely despite the weather. We saw the train a long time ago when we passed through Porthmadoc but didn’t have time to take a trip, hopefully one day we will and it will be sunny for both of our trips! The train is gorgeous and it’s a lovely experience, I think we need to do it again someday though so we can actually take in the views!! Super cool! Would love to hop aboard one day! It’s gorgeous – and run by volunteers which makes it extra special! I love the little steamy train with all the wood, and red velvet. Oh I do hope you do go back on a sunny day. I’d love to see it. Me too – fingers crossed we’ll be back one day with fair weather! We had a good time Suzanne, but sunshine would have been better! The train journeys are expensive. I am in Aberystwyth and the devils bridge return journey is £19! Thankfully the sun is shining. No rain yet. Good to hear, think you picked well weather wise!! I couldn’t believe how expensive these little trains were. I remember taking a trip on that line several summers ago, hopefully one day you’ll be able to see it in the sun! 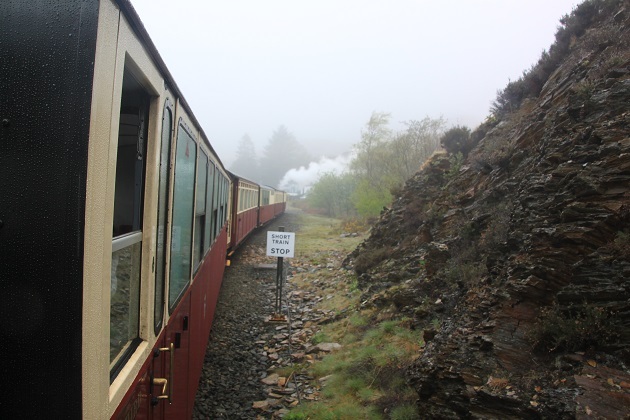 I’ve also been on the Welsh Highland Railway – which runs into Snowdonia National Park (the line was still under completion when I went, but think it now terminates at Beddgelert) – which is equally as stunning! I’ve read about that railway too – it looks stunning and we’d love to try it out as well, just on a better day!! We did enjoy the train journey despite the weather Rosemary even though it was as bad as it could be!! The fact the line is run by volunteers makes it extra special too. Your train ride sounds fun, I’m sure your little granddaughters will love it! 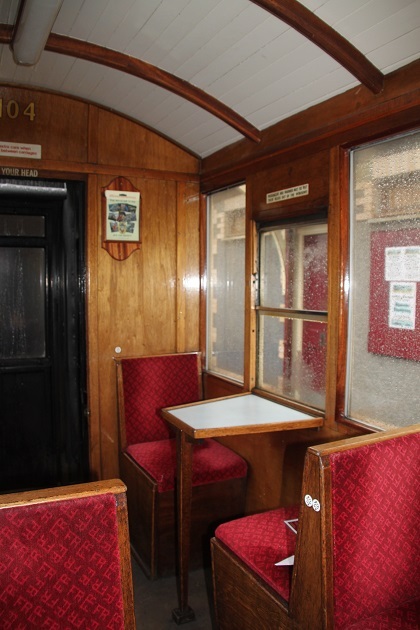 It is a wonderful old train full of atmosphere – we loved it. It is gorgeous, looked after so well and really takes you back in time, we loved it! This is a bit of a touristy experience but loads of fun. I know what you mean about air travel though. We were so looking forward to the scenery Mark having read about how glorious it was – just a big shame about the weather! Sounds like you enjoyed it too and that sounds like a great honeymoon! Weather can have such an effect on a trip. It’s been the most rainy and dreary 3 weeks in england but as I’m moving to wales soon I may have to check this out on a sunny day! If he wants to do a steam train this would be a great one – it’s gorgeous inside and the scenery (on a nice day) would be gorgeous outside!! Good luck with the move. Joy, somehow the clouds and rain gave your photos a sense of mystery and intrigue! I know your views would have been beautiful if the sun had been out! Sounds like you make the best of every journey! It was still a fun journey Pam – I think those views would have been incredible without mist, but that said it was atmospheric and the train is so beautiful so we did enjoy it rain and all!! I love train travel and everything quirky, so this sounds like a dream come true! I’m adding it to the top of my list the next time I cross the pond! Thanks for sharing! Happy travels! 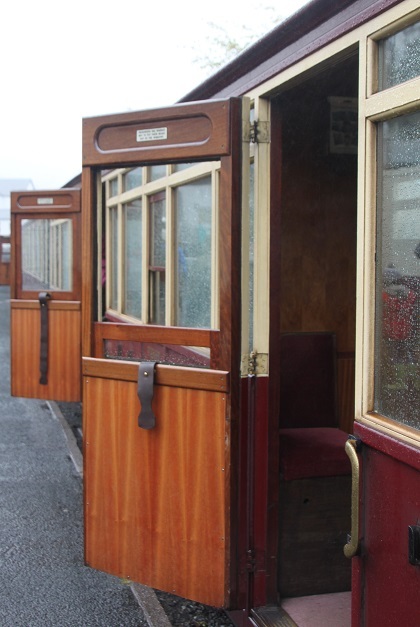 It’s great fun – the train is gorgeous and the views (on a sunny day) would be incredible, all that plus it’s run by very dedicated and lovely volunteers makes it a great day out! I would love to go back and do it again on a sunny day – I think the views would be incredible.